West Kellow Yurts are situated in Polperro on the edge of a Solar, Wheat and Barley farm. Our location is probably our best feature as it's so peaceful, yet so close to the village. Polperro was voted as the 2nd best village to visit in the UK on a recent program on TV don't you know =). yWe have been running our site since 2013 with lots of happy campers returning each year. We open from the end of March, right through until the end of September. 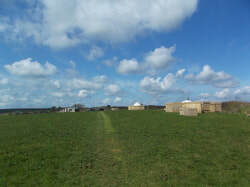 It's set in a 9 acre field with a sea view next to a quiet country lane, with very few passer's by and noise. in fact, it's mainly just the local birds you hear tweeting who get fed onsite. You can either rent 1 of the 3 yurts (or wagon/bell tent in peak season) for 2 or more night's, or book the whole site with your friends and family. The site has solar power sourced from the neighbouring fields panels (with mains back up that's rarely required) and we have fresh spring water available. We ensure It's double checked and UV tested to make sure it's fully safe to drink. There are 2 fully equipped kitchens with 2 gas hob's, 2 fridge freezers, microwave, compost and standard electrical socket's. When it warms up, you can try cooking over an open campfire, along with dutch oven's/BBQ's/kebab skewer's/campfire tripod's for the more adventurous camper chef. Each yurt will have a handout for ideas/directions or you can just use your existing skills. You can book a bush tucca experience with us upon request if this is something you would like to try. This is an added extra along with booking the local masseuse for a relaxing massage/reflexology session if this is something you would like to have to help you relax. However, they are not present on site unless you pre-book them through me (Matt), so you don't get that sales pressure whilst relaxing in a sun-lounger or hammock! Most people just visit us to relax, unwind and explore the local area which is absolutely fine and works well. I usually help run the yurt changeovers and help the cleaner do the bathrooms/kitchens around 11am-2pm, otherwise I tend to just leave guests to do as they wish, but i'm on the end of the phone if you have any questions. We have 2 tiled shower rooms/2 fridge freezers/2 flushing toilets each with basin/mirror to help start your day on the right foot. We leave you a basket of logs/kindling etc for the evening, thereafter you can purchase more from either 2 of the shops in Pelynt, various other places nearby (incl. Tredinnick farm shop at Widegates which does a good breakfast also) for about 4 pounds/bundle if needed. I often leave a few in the kitchen at cost price as well where the money can be handed to me or left in the kitchen fridge/yurt. West Kellow Yurts has prime location to walk into Polperro which takes about 15 mins across the field and down the quiet lane. It's only a 10 minute drive to Looe/Hannafore and 25 mins (with a £5 car ferry) to get into Fowey. It's a relaxing place to camp and enjoy peace and tranquility, whilst getting off the grid and back to nature in our beautiful meadow with views from the moors to the sea. You can have a snooze in a hammock/sun-lounger, wander down to the wildlife pond to watch the fish, birds, ducks and other wildlife in their natural surroundings, or take a trip out to one of the many local attractions, coves, pubs, coastal walks or beaches. A short walk for 1/2 mile across the field and down a lane will bring you into the heart of the picturesque village of Polperro. With its narrow, winding streets and alleyways and cottages perched on steep slopes overlooking the harbour, it's not to be missed. Here you can sample the many restaurants and pubs (most with beer gardens), along with exploring the family run shops before having an ice cream or perhaps visiting the Polperro Heritage Museum of Smuggling and Fishing Miniture village. Some of the pubs/local areas host live music and performances during the weekends and also weekdays during the summer months. Polperro Festival takes place every June. Looe beach (10 mins drive) and Talland Bay (even closer and much quieter) are well worth visiting along with many other coves, attraction's and area's of outstanding natural beauty. You can view more in our things to do section if you wish. All you need to bring is your usual belongings and a sense of adventure! You can get some breakfast things along the way and you are good to go. Why not book a relaxing break, load the car up and set off on an adventure to see the stunning views that the countryside has to offer.